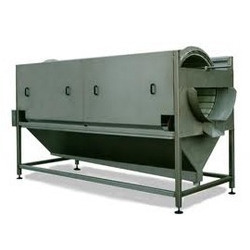 We are a leading Manufacturer of rotary fruit washer from Bengaluru, India. Counted as one of the prominent organizations, we are engaged in providing a wide range of superior quality Rotary Washer For Fruit & Vegetable that is mainly used for washing & Scrubbing vegetables & Fruits. Designed from food grade metals, this washer has nylon bristle rollers that scrub the vegetables by rotating in their own axis. Following industry defined guidelines, we manufacture the entire range by utilizing contemporary machines, modernize technology and prime grade raw material. In order to ensure quality, the entire range is rigorously tested upon a series of parameters. In tune with clients' diverse requirements, we offer the entire range in a wide range of specifications. Looking for “vegetable and Fruit washing machine”?